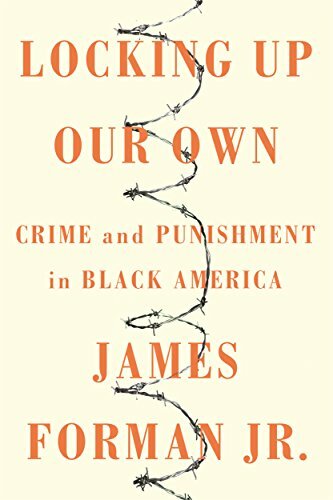 Locking Up Our Own is written by James Forman, Jr. and as the title suggests it is about the criminal justice system since 1910 thru 2016 and the affects of white supremacist themes controlling it, plus, the impact of racism in the police departments in both black and white communities; the influx of drugs cementing ones prejudices and distilling the myth of black solidarity within the world of highly effectual yet moderately powerful black clergy in WA., DC. in the 60's along with the price black men and the nation are facing regarding civil rights today. Black preachers were respected in their communities and frightened by the escalation of black on black crime within them. They were also deeply impacted by the nuances of authority and respect they were given by white politicians anxious to reduce the likelihood of black addicts eventually entering into white neighborhoods. Therefore preachers became political decision-makers regarding strict punitive penalties for blacks with drugs. Why? Well, sometimes it appeared to be a moral imperative. But Reverends were newly respected by whites' in D.C. and given the power to make decisions assumed to be in their communities own best interests, which was long overdue yet they had their own inner turmoil: resentment toward the addict; fear of the destruction they caused; resistance to the decimation of the black family unit and more. Many wanted the problem to go away, to have the addicts taken off the streets which meant they'd be locked-up and in most cases the penalties for even a small amount of drugs, could mean a life sentence. Therefore underclass blacks would be paying heavily for others who were moving ahead. Locking Up Our Own is 239 pgs with 44 pgs of footnotes. It is 2017 and the content of Forman's book is jarring as in it he explores the origins of police misconduct; the opposing views and at times dreadful errors in judgment regarding the future of Blacks. This book is honest and a valuable look into the creation of a system many are fighting to disassemble today. Kaolin as a lecturer and author of Talking About Race: A Workbook About White People Fostering Racial Equality (2010) in Their Lives and Protocol: Welcome to Paradise, Watch Your Step (2018) for more information log onto HTTP://WWW.LTAR.BIZ.